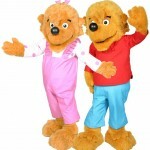 The Berenstain Bears series of books by Stan and Jan Berenstain have been a family favorite for over 50 years! The lovable Berenstain Brother Bear and Sister Bear are out on an adventure to visit all their friends and hope to make some new friends along the way. 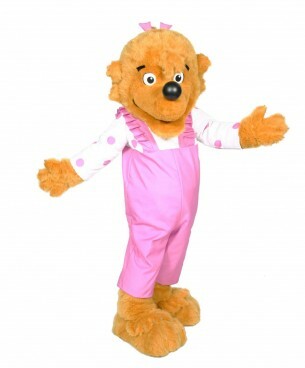 This costume set pairs naturally with The Berenstain Bears Parents costume set for a high impact family event. 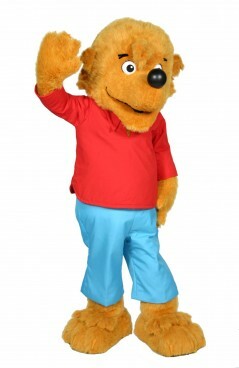 The wearers of the Berenstain Bears Kids costumes set should be 5’ 2” to 5’ 4” and weigh between 120 to 140 lbs. 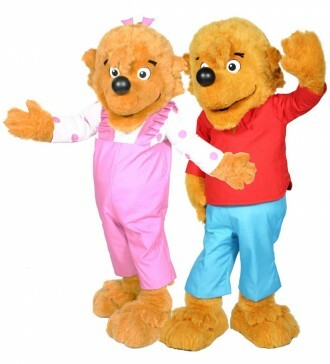 The rental fee for the Berenstain Bears Kids costume set has been graciously provided by Harper Collins Publishers for promotional use only at schools, libraries, and bookstores. The only cost to you is Second-Day Air shipping arranged by Costume Specialists to send the costume to its next event which is only $280.00. 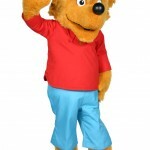 Search for us on Google: Berenstain Bears Costume Character rental or Berenstain Bears Character Appearance Program.